From the details kindly given by Louis-André Valtat, the artist's grandson, who is preparing a new edition of the annotated catalogue of Valtat's works, this painting was executed around 1900. The place represented here, a public garden covered in snow where an ice-skating rink has been created, could be the garden of the Petit Trianon in Versailles. According to the plans, Valtat might have chosen the view from a point just left of the small bridge leading to the Temple of Love, on the side of the Saint Antoine alley. The poplars have gone, but the river is still there, and follows the same winding course. Beyond it, the side wall of the Petit Trianon is clearly visible. The artist, whose family had been living in Versailles since 1880, had grown up not far from this historical garden, which is still today one of the places the inhabitants of Versailles like best to go for a stroll. Many years before, in 1868, Renoir had painted Skating in the Bois de Boulogne (private collection), with a similar composition in its broad lines to that of Valtat. The latter might have seen Renoir's work at Ambroise Vollard's, their common dealer, unless he had only seen its photographic reproduction, as at the time Vollard was gathering the necessary documents to draw up an annotated catalogue of Renoir's works. But this painting shows Valtat's originality and undeniable sense of humour. In the foreground, the fowl-geese and ducks-are reduced to schematic outlines, almost caricatures. The birds, quietly settled along the bank, are aligned like the audience of a show, and seem to be the main subject of the composition. 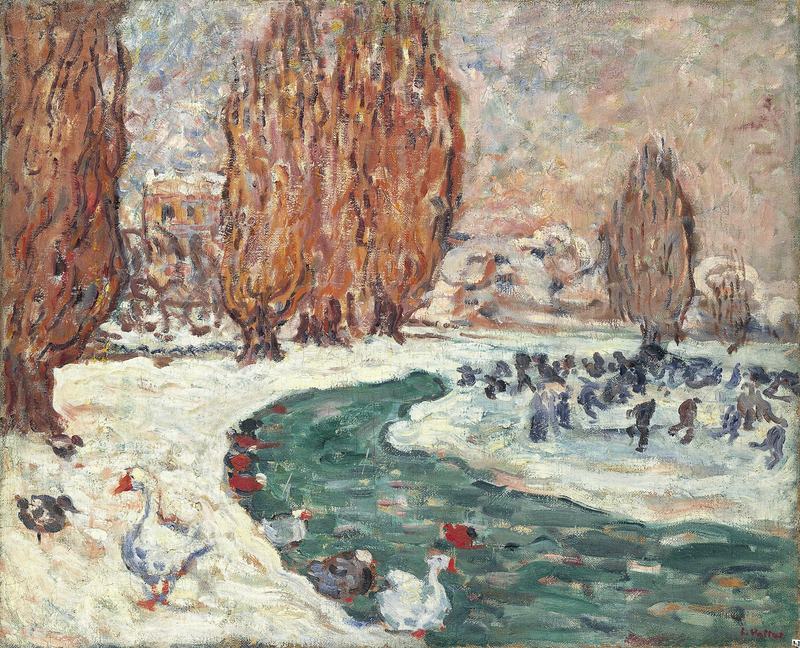 The artist has placed in the background the small, dark, quickly sketched silhouettes of the skaters going round in circles on the patch of ice allocated to them, and the foreshortening perspective chosen by the painter gives them the aspect of insects, tiny compared with the geese. The marked, elaborate and varied touch, with some unexpected brightly coloured spots, reveals the artist's pre-Fauvist temperament. The composition is organised in two main areas with contrasting colour ranges: in the foreground, cold shades; in the background, warm colours. The representation of the snow is particularly remarkable, and the beautiful orchestration of whites, heightened with touches of blue, grey and pink, makes this work comparable to Monet's snowy landscapes. The water is slate blue, the poplars are depicted like flames with reddish shades which warm up the colour, so precisely rendered, of a snowy sky, grey and heavy, with undefined shades. This almost tactile application of the colour of the sky, where the artist mixes pinks, mauves, lilac, blues, greys, whites and even some touches of red, shows an indisputable predilection for colour. The covered-up shadows, the simplification of the composition and of the perspective, contribute to the modernity of this landscape, representative of the artist's production at the turn of the century.